A prototype rapid-response CO2 sensor was used in conjunction with a Lyman-alpha hygrometer, fine-wire thermocouples and a three-dimensional drag anemometer to measure CO2, humidity, temperature and wind velocity fluctuations. Measurements were made over a soybean crop grown on relatively flat terrain near Mead, Nebraska. 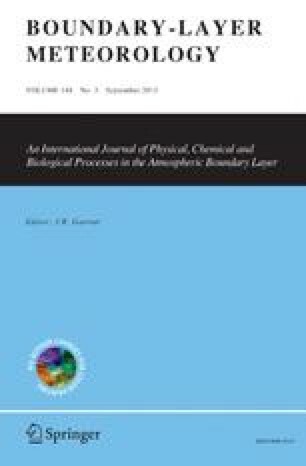 Temperature, humidity and CO2 spectra measured under near neutral conditions were most similar in shape while longitudinal velocity (U) spectra appeared to be somewhat broader. Peaks occurred around f = 0.02 to 0.06 (where f is the non-dimensional frequency) in all spectra except for vertical velocity which had a peak near f = 0.5. As thermal stability changed from neutral to stable, spectra exhibited lower peaks, were narrower in shape and were shifted towards higher frequencies. Opposite behavior was observed with increasing instability. Cospectra for momentum, heat, water vapor and CO2 measured during neutral conditions had similar peak frequencies (near f = 0.15). Among the cospectra studied, CO2 and water vapor cospectra had the greatest similarity in shape. Published as Paper No. 7481, Journal Series, Nebraska Agricultural Experiment Station. The work reported here was conducted under Nebraska Agricultural Experiment Station Project 27-003 and Regional Research Project 11-33. Post-doctoral Research Associate and Professor, respectively, Center for Agricultural Meteorology and Climatology, Institute of Agriculture and Natural Resources, University of Nebraska, Lincoln, NE 68583-0728.